The major river in Ventura County Flood Zone 2 is the Santa Clara River with a watershed area of approximately 1,634 square miles. 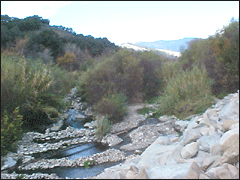 Most streams in Zone 2 are tributary sources to the Santa Clara River with eventual drainage to the Pacific Ocean. 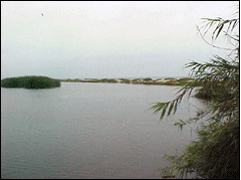 The only exceptions are minor water courses in coastal watershed portions within the near-coast areas of the City of Oxnard, City of San Buenaventura, and City of Port Hueneme which drain directly to the Pacific Ocean instead of flowing to contribute their runoff to the mighty Santa Clara River. The largest of these direct-coastal drainages is the Arundell Barranca that collects and channels runoff from Lake and Sexton Canyons in the central portion of the City of San Buenaventura foothill areas before discharging into Ventura Harbor. The Santa Clara River is somewhat unique in that it is the largest natural river system in southern California remaining in a relatively undeveloped state. Its headwaters are located on the north side of the San Gabriel Mountains near the unincorporated community of Acton in Los Angeles County. 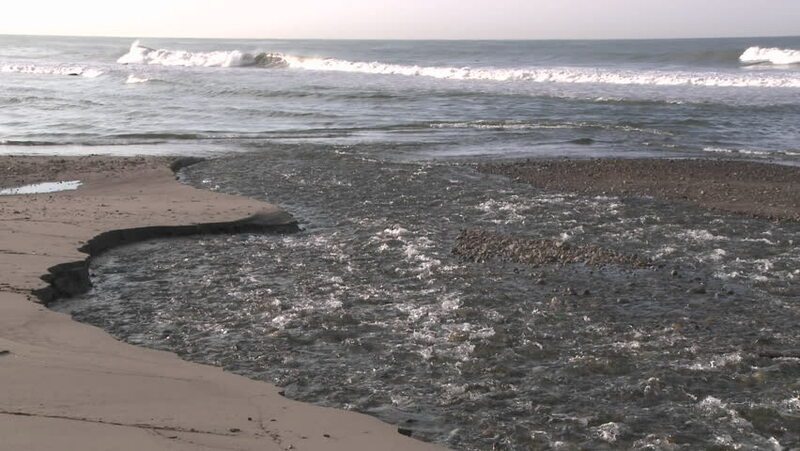 The Santa Clara is a braided stream that flows westerly for approximately 84 miles winding through Ventura County to its outlet into the Pacific Ocean on the south boundary of the City of San Buenaventura. Major tributaries include Castaic Creek and San Francisquito Creek in Los Angeles County, and the Sespe, Piru and Santa Paula Creeks in Ventura County. 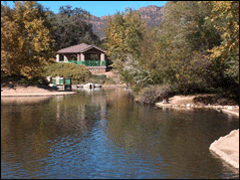 Approximately 60 percent of the watershed is located within Ventura County. About 90 percent of the watershed is located in mountainous terrain, with the remainder consisting of the relatively flat floodplain areas of the Oxnard Plain, Santa Clarita Valley, Castaic Valley, the Santa Clara River Valley. The floors of some notable larger canyons including the upper Soledad, lower Sand, Mint, Bouquet, Placerita, San Francisquito, Piru, Santa Paula, and Sespe Canyons also contribute runoff to the main branch of the Santa Clara River (VCWPD, 2003). 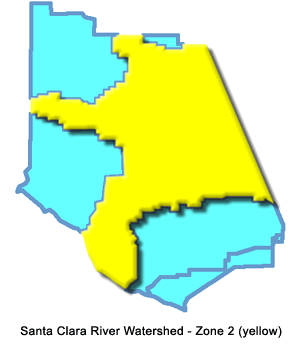 Ventura County Flood Zone 2 boundaries incorporate all five of the Supervisorial Districts of Ventura County, however the bulk of Zone 2 is within Supervisor District 3. The climate of the Santa Clara River watershed is characterized by long, dry periods and a relatively short wet period during winter of each year. Cool moist ocean winds have a moderating effect on the climate near the coast. Frosts are rare in the coastal region and common in the inland valleys and mountains. The types of storms that may occur in the basin are general winter storms, with an occasional thunderstorm or tropical cyclones blowing in from the expansive Pacific Ocean. Approximately 75 percent of the annual precipitation occurs in the months between December through March. The mean seasonal precipitation varies from about eight inches on the valley floors near the eastern boundary of the basin (in western Los Angeles County), to over 40 inches in the highest mountains in the basin (northeast portion of Ventura County). Seasonal rainfall average is approximately 14 inches as recorded near the coast at the river estuary outlet into the Pacific Ocean. The Santa Clara River watershed is underlain by impervious schist, quartzite, slate, limestone, and granite in the upper reaches, with extensive faulting throughout the basin. Valley floors are typically composed of mostly horizontal layers of sedimentary alluvium or colluvium, with sediments deepening considerably beneath the Oxnard Plain. Rock types are exposed over large areas in the mountainous upper terrain of the watershed, and also in many foothills surrounding the valleys and plains. Most of the basement complex is overlain by sandstones, conglomerates, and shales that outcrop over large areas. Alluvial deposits cover the floors of the larger valleys to depths of more than 1,000 feet. Notable exceptions are the Oxnard Plain and major floodplains trending in a northeast to southwest direction, where sediments are some of the deepest river deposits in the world at nearly 30,000 feet within the larger geomorphic structural feature known as the Ventura Syncline. Soft unconsolidated near-surface deposits are generally unstable and easily eroded during significant stream or river flows. Such flows present a complex sediment management problem to consider in the design and maintenance of flood control channels, debris basin catchments, and other watershed improvements. Ancient and not-so-ancient alluvial soils (Geologists refer to the current period as Recent – or more technically – the Holocene) within the Santa Clara River Drainage Basin form a connected series of pervious deposits that serve as natural underground reservoirs (what Hydrologists call aquifers) which contain the bulk of or local – and quite vital – groundwater supplies. A groundwater “forebay” area at the upper (northern) end of the Oxnard Plain serves as a recharge area for the extensive confined aquifers (up to six distinct water-bearing mostly sandy layers) underlying much of the greater Plain because there is no continuous natural clay cap in this Oxnard Plain Forebay Basin to inhibit deep percolation of rain or stream seepage. 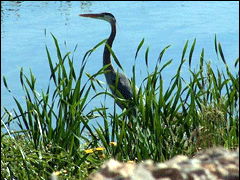 Being the perfect conduit or percolation path, the Forebay contains large man-made recharge ponds operated by the United Water Conservation District (UWCD). When excess river flows are available, UWCD diverts a portion of the Santa Clara River volume into a settling basin that slows the flow and allows most of the sediment load to sink out-of-solution before such water can fill the groundwater recharge (or deep percolation) ponds along the river’s south levee. A bedrock intrusion (subsurface high) near the Los Angeles/Ventura County boundary forces rising groundwater in the river channel and leads to perennial flow in the river reach downstream of this below-grade underflow barrier. Santa Clara River Estuary at dawn looking west at the enclosing sand berm and the Pacific Ocean in the distance. With no natural surface water impoundments, it is worth noting that a handful of major man-made water supply reservoirs are located within the Santa Clara River watershed. These include the largest called Lake Castaic, a much smaller further north (and similar sounding) Castaic Lake, UWCD’s Lake Piru Reservoir, Bouquet Reservoir, and Pyramid Lake (a State Water Project Reservoir). 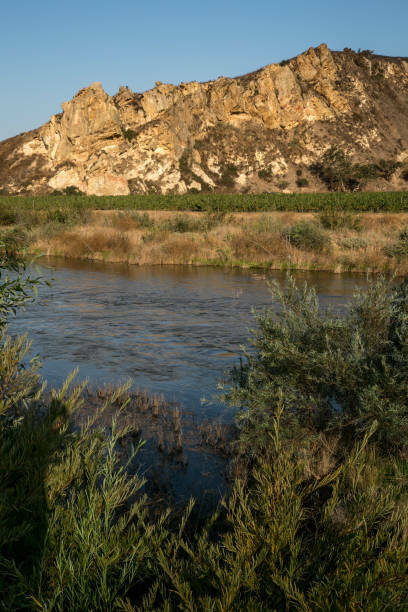 The Ventura County Watershed Protection District has a number of flood control basins designed to capture debris before it can enter the main stem of the Santa Clara River. Basin names include Warring Canyon, Jepson, Fagan, Adams Barranca, Cavin Road, Real Wash, and Franklin Barranca debris basins. Past areas of major flooding in Zone 2 include portions of the Santa Clara River near the cities of Santa Paula and San Buenaventura, plus local coastal drainages such as the Arundell Barranca mentioned earlier. If Ventura County Watershed Protection District (VCWPD) debris basin designs prove worthy, there will be very few if any future catastrophic floods in these areas.